WWE’s Superstar Shakeup kicked off on this week’s WWE RAW. 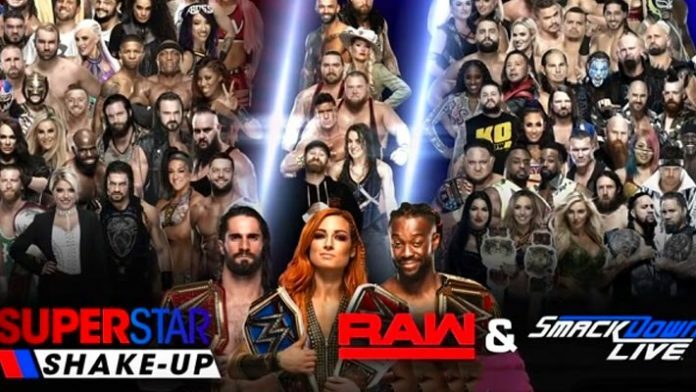 Several Superstars have moved from SmackDown to Raw. The draft continues Tuesday night with SmackDown Live. WWE also typically announces more brand switches online, so it will probably be a few days before the dust settles and all moves are finalized. This year’s shake-up is the thirteenth ‘draft’ produced by WWE. The rosters are freshened up, creating new possible storylines and feuds. Previously it was known as the WWE Draft. The event evolved into theSuperstar ShakeUp in 2017. The Miz was the first Superstar Shakeup move from SmackDown to Raw. He surprised Shane McMahon at the start of Raw. Miz has been tossed back-and-forth between Raw and SmackDown Live since his main roster debut in 2006. Shane McMahon, as of now, is still a SmackDown Live staple, so it will be interesting to see how his feud with Miz continues to play out. The second draft to the Blue Brand came in the form of a duo. Zelina Vega and Andrade appeared on Raw, taking part in a match against the Intercontinental Champion, Finn Balor. Vega and Andrade haven’t had much title success on SmackDown, but that could all change now that they’re on Team Red. Rey Mysterio interrupted Elias as the next new draft to Raw. Mysterio has spent the majority of his time on SmackDown feuding with Andrade and Superstars like Samoa Joe. Mysterio could easily continue his battle with Andrade, but it appears that NXT call-up Lars Sullivan has his eyes on him, first. The Usos appeared on Raw’s Superstar Shake-Up from Tuesday’s brand as a pair, moving to their new home intact as a tag team. They lost their SmackDown Tag Team Titles to The Hardy Boyz on the SmackDown after WrestleMania, but they’re sure to be after Raw‘s belts. Unless Roman Reigns moves to Tuesday nights, the Usos will also be on the same brand as their cousin. EC3 is officially on the Raw brand now, but it was a rough first night for him. He issued an ‘open challenge’ that was answered by Braun Strowman. The giant absolutely destroyed EC3. The One and Only Ricochet is officially part of the Raw brand. He competed in the 8-man tag team match that opened this week’s show. Since Aleister Black was not drafted yet, it appears this popular upstart tag team might be going their separate ways already. Lacey Evans defeated veteran Natalya in her first match as a member of the Raw roster. She looked great in her ‘debut’ and appears to be the top challenger for the reigning queen of both WWE’s women’s divisions, Becky Lynch. Bayley could not get a hold of her tag team partner Sasha Banks, but she a replacement in Naomi, who is now on Raw. The defeated Women’s tag team champions the IIconics, Peyton Royce and Billie Kay, in about two minutes. Sanity leader Eric Young has is now on Raw. His move to Raw was flashed on an on-screen graphic. Former WWE Champion AJ Styles was the final Superstar to jump to Raw. Throughout the show, WWE advertised Roman Reigns, Seth Rollins and a mystery partner against Drew McIntyre, Baron Corbin and Bobby Lashley as the main event. It was teased that Rollins and Reigns’ partner would be a SmackDown acquisition and WWE delivered in a big way.